INSPECTION: Morning of sale from 8:00am to 11:00am. Lucas mdl. 20DCP5S Horizontal Boring Mill s/n 20DC0307 w/ Lucas Controls, Acu-Rite III DRO, 36” x 60” x 60” Travels, 24” Quill Travel, 15-1500 RPM, 50 Taper Spindle, 4” Spindle, Vertical Milling Attachment with Bridgeport Milling Head, 2Hp Motor, 60-4200 RPM, Kurt Power Drawbar, Mitutoyo Digital “Z” Scale. Bridgeport Series II Vertical Mill s/n 8085S w/ Acu-Rite MillMate DRO, 2Hp Motor, 60-4200 Dial RPM, Power Drawbar, Chrome Box Ways, Power Feeds, 11” x 58” Table. Bridgeport Vertical Mill s/n 272662 w/ Acu-Rite DRO, 2Hp Motor, 60-4200 RPM, Power Drawbar, Chrome Ways, 7” Riser, 9” x 48” Table. Wells Index mdl. 847 Vertical Mill s/n 21877 w/ Acu-Rite II DRO, 2Hp Motor, 50-4200 RPM, R8 Spindle, 9” x 46” Table. Wells Index mdl. 847 Vertical Mill s/n 20434 w/ 50-4200 RPM, R8 Spindle, Power Feeds, 9”” x 46” Table. Wells Index mdl. 745 Vertical Mill s/n 15281 w/ 75-2850 RPM, 8-Speeds, R8 Spindle, 9” x 47” Table. Milwaukee Kearney & Trecker No. 2UNIV Horizontal Mill s/n 57-3637 w/ 35-1400 RPM, 50 Taper Spindle, Power Feeds, Arbor and Support. Moore No. 3 Jig Boring Machine. Piranha mdl. P70 70 Ton Iron Worker s/n P70-094 w/ 11” Throat on Punch Head, 18” Shear, 5” x 5” Angle Shear, 3 ½” x 5” Coping Notcher, Foot Control. Enco 48” Power Roll w/ 3” Rolls. Enco 48” Hand Roll w/ 3” Rolls. Chicago mdl. W-3148” Finger Brake s/n 108890. Whitney Jensen mdl. 68 Kick Punch s/n 1784-5-69 w/ 24” Throat. Hossfeld Size No.12 Universal Bender w/ Dies. (5) Acorn 5’ x 5’ Forming Tables w/ Hold-Down Accessories. Scherr Tumico 14” Floor Model Optical Comparator w/ Surface and Profile Illumination. Cleveland “Product-O-Ron” Rotary Surface Roughness Gage w/ Cleveland Micron Readout Unit. Kentrall mdl. CT-4 Rockwell Hardness Tester s/n 114. Brown & Sharpe 12” Height Master. 24” Dial Height Gage, Mitutoyo and Starrett Vernier Height Gages. Gage, Height and Angle Block Sets. 60” and 40” Vernier Calipers. Starrett 15” and 12” Master Levels. Starrett 20”-24”, 16”-20”, 12”-16”, 9”-12” OD Mics. 12/2006 Haas VF-9B/40 5-Axis CNC Vertical Machining Center s/n 1054806 w/ Haas Controls, 24-Station Side Mounted ATC, CAT-40 Taper Spindle, Thru Spindle Coolant, 10,000 RPM, Haas OTS Tool Touch Probe System, Renishaw Touch Probe and Wear System, Programmable Coolant Nozzle, Rigid Tapping, Brushless “A” and “B” Axes, Coordinate Rotation and Scaling, Macros, Second Home Button, M19 Spindle Orientation P & R Codes, 10mm Pitch Ball Screws, Air Blast, No Counterbalance, USB Port, Chip Auger, High Flow Coolant. 7/2010 Haas V-5 4-Axis CNC Vertical Machining Center s/n 1078725 w/ Haas Controls, 20-Station ATC, CAT-40 Taper Spindle, Thru Spindle Coolant, 7500 RPM, Haas OTS Tool Touch Probe System, Renishaw Touch Probe and Wear System, Programmable Coolant Nozzle, Rigid Tapping, Hand Wheel, Chip Auger, High Flow Coolant and Filtration System, USP Port, Lighted Front Tool Storage Rack. (2) Mori Seiki SL-3A CNC Turning Centers w/ Fanuc Controls. 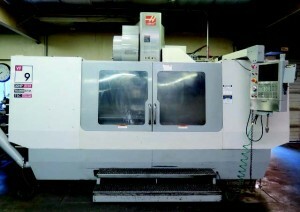 Mori Seiki SL-2B CNC Turning Center w/ Fanuc Controls. LNS Quickload Automatic Bar Loader/Feeder. Lodge & Shipley “Power Turn” RXE2516 26 ½” x 96” Big Bore Lathe s/n 49926 w/ 8-450 RPM, 20” Swing Over Cross Slide, 26 ½” Swing Over Carriage, Inch Threading, Tailstock, Steady Rest, 9 ¼” Thru Spindle Bore, (2) 21” 4-Jaw Chucks (Front and Rear), Aloris Tool Post, Coolant. LeBlond Regal 19” x 88” Sliding-Gap Gap Bed Lathe s/n 10E299 w/ 13-1000 RPM, 19” Swing Over Bed, 38” Swing Over Gap, Inch/mm Threading, Tailstock, Aloris Tool Post, 36” Face Plate. Tarnow mdl. TUJ50x1500 21” x 64” Geared Head Gap Bed Lathe s/n 1608 w/35.5-1800 RPM, Inch/mm Threading, Tailstock, Trava-Dial, 16” 4-Jaw Chuck, 18” 6-Jaw Chuck, 12” 3-Jaw Chuck, 10” 4-Jaw Chuck, Coolant. (2) Clausing “Colchester 15” 15” x 54” Geared Head Gap Bed Lathes w/ 25-2000 RPM, Inch/mm Threading, Tailstock, Steady Rest, Trava-Dial, 5C Collet Closer, 12” 4-Jaw Chuck, 10” 6-Jaw Chuck, 10” 3-Jaw Chuck, Coolant. H.E.M. Saw mdl. H105A 14” Automatic Horizontal Band Saw s/n 474695 w/ HEM Controls, Auto Feeds, Coolant, Conveyors. DoAll mdl. TF-1421 14” Vertical Band Saw s/n 337-77344 w/ DoAll Controls, Hydraulic Clamping and Feeds,Conveyors. 1994 Kama mdl. EV-996 6” Miter Horizontal Band Saw w/ Coolant and Conveyors. DoAll mdl. 2013-V 20” Vertical Band Saw s/n 457-88877 w/ Blade Welder. Grob mdl. 4V-18 18” Vertical Band Saw s/n 3011 w/ Blade Welder. Bewo 14” Miter Cold Saw w/ 2-Speeds. Rockwell “Unisaw” Tilting Arbor Table Saw. Hitachi 16” Miter Saw w/ Custom Stand and Fence System. Blanchard No. 18 Blanchard Grinder s/n 8161 w/ 30” Electromagnetic Rotary Chuck, 18” Grinding Head, Coolant. Chevalier Precision Endmill Sharpener s/n I5872004 w/ 5C Air Fixture. Almi / Jancy mdl. AL150 6” Coping Sander s/n 157. Baldor and Dayton Pedestal Grinders.